Democratic state lawmakers held a hearing on the Clairton Coke Works fire and subsequent air quality issues Thursday, drawing a large crowd of steelworkers and Mon Valley residents to the Clairton Municipal Building. Steelworkers and residents near U.S. Steel’s Clairton Coke Works packed a hearing Thursday afternoon that Democratic state lawmakers convened over recent air quality problems stemming from a December fire at the facility near Pittsburgh. The fire damaged pollution control equipment, and a nearby air monitor has since detected several spikes of sulfur dioxide, an irritant that can cause respiratory issues. Dr. Karen Hacker, director of the Allegheny County Health Department, told lawmakers that her agency is installing several new monitors in the area. “We all are entitled to clean air,” she said to the panel, which was a joint Senate-House Democratic Policy Committee that met in Clairton. She offered a host of recommendations to legislators and said her office is already working on them with the Pennsylvania Department of Environmental Protection and legislative staff. Among her suggestions are new policies to allow for the immediate shutdown of facilities whose emissions exceed air quality standards at monitors, as well as requiring that coke plants and other industrial facilities reduce production on days with bad air quality. She also asked for rules requiring industry officials to notify communities affected by problems that could impact public health, and ones increasing monetary penalties for air quality violations. “That’s precisely what we’re trying to get to, ways in which we can make it easier for you to do your work and be able to do what needs to be done to make sure these facilities are in compliance,” said Sen. Jay Costa, D-Forest Hills. Jim Kelly, the county’s deputy director for environmental health, said the health department will levy an enforcement action against U.S. Steel once it has finished analyzing the recent air quality problems. 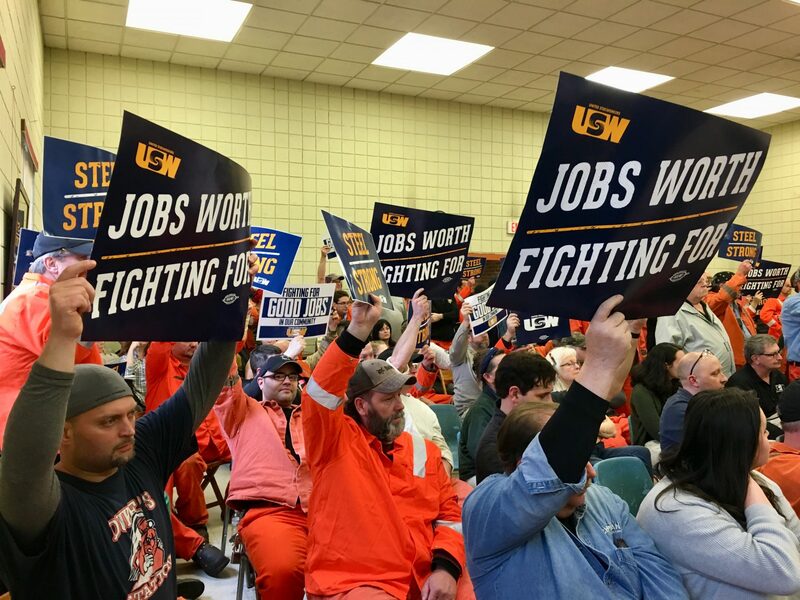 Lawmakers on Thursday also heard from union members, U.S. Steel representatives and environmental and health advocates. Dr. Deborah Gentile, a local pediatric allergy and asthma expert, said Mon Valley residents have spent a month under an alert from the county health department urging them to limit outdoor activity. She has monitored local children’s health during that time, and she called for more specific guidance. Other advocates renewed calls for Clairton Coke Works to go on “hot idle.” The facility would remain running, but it would not produce any coke, which is the product of heating coal at high temperatures. Coke is then used to make steel. Michael Rhoads, plant manager of Clairton Coke Works, said if officials ordered the plant to idle, it would take several months to prepare. He said workers would need to install significant amounts of scaffolding and piping, as well as go through many detailed procedures. “If you don’t do it right, the potential for an explosive atmosphere in the piping is significant, so it’s a big deal and we’ve got to make sure it’s done safely,” he said. Union members expressed concern about the economic toll idling would place on steelworkers and others in the surrounding communities. Don Furko, president of United Steelworkers Local 1557, represents 1,200 workers at Clairton. He said the coke produced at the plant feeds every U.S. Steel blast furnace. Legislators said they want to better communication and collaboration from U.S. Steel. Several expressed disappointment that it took two weeks between the fire on Dec. 24 and a notice from the Allegheny County Health Department on Jan. 9 letting the public know about air quality concerns. Lawmakers themselves were in the dark. U.S. Steel representatives did notify the health department the day of the fire, but health officials say it wasn’t clear how the incident was affecting air quality until days later.